“Look at how happy she is,” you think to yourself as you see your friend walk across the parking lot towards you. She has recently lost a few pounds and seems vibrant and energetic. You can tell by the new, colorful clothes she is wearing that she has recently gone shopping for new clothes to fit her smaller frame and confident demeanor. “Did she get a haircut too?” you think again as she gets closer. Suddenly, you feel frumpy, sloppy, and embarrassed about your perpetual inability to not only lose weight, but to even throw together a decent outfit, let alone get a comb through your hair or smear concealer on the bags under your eyes. From the outside, it seems like she has it all together. Happiness abounds. Problems solved. You cringe as you notice a slight bounce in her step. You want to be skinny. You want to feel put together. You want to be happy. Most of us deduce through observations such as these that happiness is available through the reshaping of the body. I know- I’ve heard it thousands of times in my work as a body image coach. When I suggest that perhaps there is another route to happiness or a way to feel good in the body other than losing weight, I literally get laughed at –sometimes loudly– or at least I get a doubtful look with rolling eyes unable to hide their extreme annoyance with me. In fact, most people are afraid to love and accept their body because they are so committed to a body type they want to achieve. Let me repeat myself in case you missed the irony in that statement: most people are willing to bypass loving and accepting themselves and would INSTEAD choose to continue tirelessly working toward some ideal they believe will give them everything they want. Only it won’t. Statistically speaking, even if they reach their goal, they still won’t be happy and the endless pursuit for perfection lingers. The REAL work, the part of the process that really matters, is learning to love, accept, and be comfortable with who you are. When you look at your friends and see the seemingly boundless joy that comes with looking great – you must remember this – that joy is conditional. That joy is teetering every moment on the brink of being taken away by a higher number on the scale, missing a week of exercise, or even by illness or unexpected injury. This, my friend, is what I like to call Artificial Acceptance. My definition of Artificial Acceptance is feeling happy, energetic, and confident due to external circumstances. This means that you feel good about yourself based on what others think or say, or by some achievement or goal you have reached. And it works – until it doesn’t. I know, I know- you have lists of people who have been happy for years after losing weight or starting CrossFit. You really DO believe you can be happy after you _________ (lose weight, eat better, get more toned, run the marathon…). However, we learn in almost every spiritual tradition that the only REAL happiness, the only REAL love, the only REAL beauty comes from within. It comes because you work at remembering that you are still valuable and worthy no matter your weight. You are still capable of giving and receiving love even when you’re wearing sweatpants with mismatched socks. You are still beautiful, even though you live in a culture that wants to limit beauty to one standard, simply because you are YOU. That’s it. This kind of acceptance takes a lot of work. It takes purposefully relearning how to relate to yourself. It means sometimes feeling isolated and alone when out with friends or at parties while everyone else fosters artificial acceptance. It means breathing. It means sometimes praying. It means looking at your story and who you are. It means saying mantras or writing affirmations. It means throwing away magazines and refusing to subscribe to HBO. It means reading books about mindfulness instead of the latest diet book. It means finding a community that lifts you up and supports your journey to true self-love. It sometimes means leaving relationships. It can mean therapy for some and meditation for others. It can mean going on a yoga retreat instead of a week at the beach. OF COURSE most of us prefer to bypass all that work! OF COURSE most of us choose to diet instead. The work of finding REAL and TRUE acceptance for yourself is not easy, and certainly no joke. Now, you are likely wondering what it is that I am actually trying to encourage you to do. I haven’t made the Body Love/ Self-Love journey sound at all appealing. But the truth is that there is no other journey as rich, full, or awakening as this one. This path propels you into a deeper consciousness, heightened connectedness, and allows you to see and acknowledge the beauty not just in you but the beauty all around you! There is no other path more worth it than the path of TRUE acceptance and love. When you choose this work, love, joy, and acceptance cannot be taken from you with changing outside circumstances. You will carry these qualities deep inside you, unwavering, no matter what you see when you look in the mirror. What a gift! Why would you want to live any other way? Are you ready? Awesome. Welcome! Start simple. Go through your books and magazines and get rid of the ones that make you feel “less than.” Join a gentle yoga class. Join an on-line community that promotes the Health At Every Size® paradigm or body positivity. Write a list of 10 things that make you beautiful aside from physical appearance. Look at yourself in the mirror and take a deep breath. Set an itty-bitty goal such as to meditate or pray just a few minutes a week. Thank your body every day. Remind yourself as often as possible that you are valuable, worthy, and deserving of love because you are human and you are alive. Emily Brown is a Body Image Activist, Intuitive Eating Counselor, Yoga Instructor, and Eating Psychology Coach who has made it her life work to completely revolutionize the way we think about health and our bodies. Her Body Love program helps participants heal their relationship with food and body and inspires them to “take up space” in a world that asks us to be small. 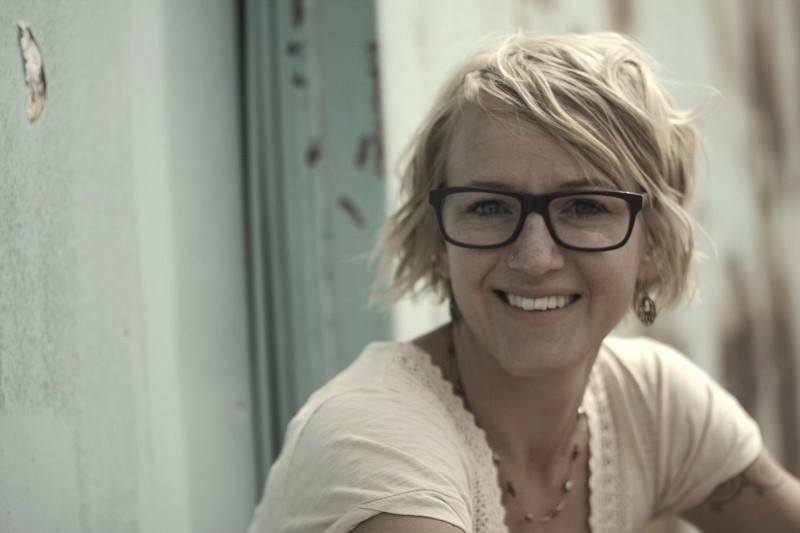 She has owned and operated Blossom Yoga in Laramie, WY since 2008 and is one of the primary teacher and developer of Blossom Integrative Yoga Teacher Training. It is through yoga and understanding the true value of food that she began to feel freedom after years of over exercise, struggle with food, and hating her body. She has a passion to empower others to live fully, speak confidently, and realize their self-worth. Emily believes totally that when we express ourselves authentically we will recognize endless potential and begin to change the world! Connect with Emily at http://www.bodylovebyemily.com or https://www.facebook.com/bodylovebyemily. I especially like the author’s advice to avoid exposing yourself to the media, giving the example of HBO or magazines [presumably those that make you feel bad about yourself] and even cutting off destructive relationships. I have always felt that it really matters a lot at what you expose your mind to; vested interests (the diet industry, to name only one of many) have high incentives to make you want to feel badly about your size and other physical characteristics, so that you will BUY their products. Your actual well-being is not their concern. Thanks for your comment! It’s true, there aren’t many companies/organizations who are profiting off of acceptance. We have to become more and more aware of the messages we taking in and CHOOSE, when possible, to allow space for a different message. Thank you – so very much – for this post. It’s made some things click in my head that I think are absolutely vital in my current search for myself. Not just about size, but about all things. “This means that you feel good about yourself based on what others think or say, or by some achievement or goal you have reached. And it works – until it doesn’t.” — this applies equally well to any achievement or goal, be it a promotion, a new business started, a baby had, a wedding, a mended relationship, anything: if you’re relying on approval from others for your well-being, it’s all bad. I knew that, but I couldn’t put it all together as well as you’ve done here, so thank you, so much. I appreciate what you are saying, and I’m sure there are people who have the unrealistic expectations you mention for whom this is extremely helpful. But I’m concerned about the extent to which isolated individualism seems to creep into your ideas. We do not live outside of a family, a community, a culture, a society. We are part of those things, even when they are toxic. Nobody completely pulls their own strings and completely creates their own reality (which bears no resemblance to the reality of their friends, loved ones, family, culture, society). Or rather, some people do, and they are known as sociopaths — people on whom social norms and values have no effect. I have not seen many members of my own family in person in almost 25 years. I made a decision that I did not want to see the disappointment in their eyes or listen to them going on and on about how “concerned” they are about my “health” (meaning: fatness). Yes, that can be done. But it is not without great cost. When you have isolated yourself from your whole family to the point of not seeing them for decades, you have, well, no family. And I’m not entirely sure that’s better than having a toxic and disapproving one. Yes! Thanks for your comment. You are totally right. I wasn’t so much suggesting for people to isolate themselves as encouraging all of us to find a deeper sense of satisfaction and contentment from within. Yes, we are all connect and exist together. Hopefully, as more of us find a deeper sense of happiness inside ourselves that will help encourage other do the same. I agree, isolation isn’t the answer. While sometimes there are particular people or experiences we might choose to spend less time with, community is so important as well! Thank-you for your perspective.